Cu ocazia primului nostru eveniment outdoor am ales sa-l invitam la pupitru pe un prieten drag noua, Nu Zau. Alaturi de el vor mai urca la pupitru Lucas alaturi de Acid Casual b2b Timirash. Accesul in locatie se face prin spate, de langa stadionul Dan Paltinisanu. 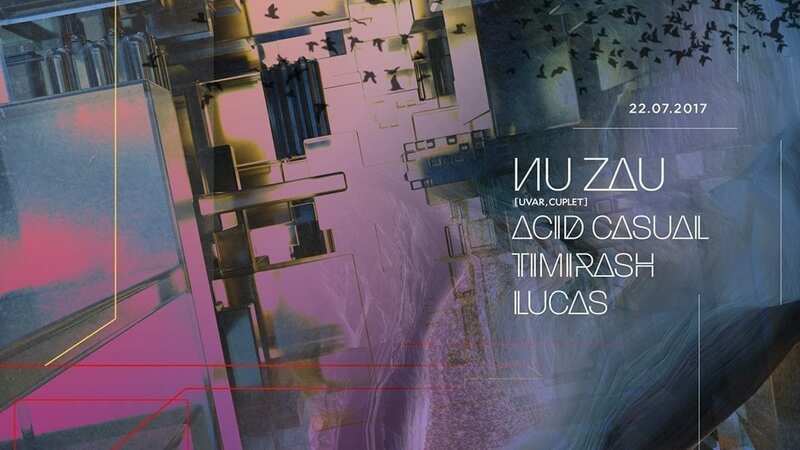 Nu Zau is one of the leading producers and dj’s that have come out of Romania’s electronic scene in the past few years. Inspired by already well established names such as Ricardo Villalobos, Rhadoo, Thomas Melchior and many others,he’s grown into a romanian household name in a very short year span. Dark, percussive, funky and quirky would be the best way to describe his sound, already having releases on various labels, he’s signed EP’s, individual tracks and remixes on labels such as Fear of flying, Aeternum Music, Memoria Recordings . In time a new label vinyl project is created by the name of Uvar, which he co-runs with fellow romanian Sepp. His productions have gained world wide recognition – Raresh, Rhadoo, Ricardo Villalobos, Petre Inspirescu, Fumiya Tanaka, Onur Ozer, Bill Patrick are only a few of the best dj’s that can be heard playing his tracks. As a DJ he seemlessly blends through oldschool records and new wave productions alike, crossing borders musically and inspiring people wherever he plays, be it in romanian clubs , or beyond romanian borders such as: Output (New York), Stereobar (Montreal), Sankeys (Ibiza), Gipsy (Moscow), Origami (Tokyo), Bloc (Barcelona), Club der visionaire (Berlin), Paradigm (Groningen, NL), Underground (Ibiza), Pigallion (Paris, FR), Crucifix Lane (London, UK), FUSE (Brussels), Rodnya (Moscow), Treehouse (Miami), Flash (Washington DC), Facktura (Odessa,Ukraine), Concorde Atlantique (Paris, FR) and many more. Growing among elitist music lovers, Lucas always knew that he is going to be a part of the music scene one way or another. His love for electronic music came in his early 20`s after getting hypnotized at a few parties.Right away he realized that this is the road that he should take and he’s been “evolving” ever since. Hailing from Arad, Romania, he is considered one of the most innovative young music selectors of Romania’s electronic music underground scene. He started mixing in 2010 and since then he has gathered much positive feedback, having also shared the decks with renowned artists from the national and international scene. His sets have a distinctive personal touch delivering a perfectly balanced mixture of groovy beats, warm pads and musical emotions that will get you addicted. “Music is the art of thinking with sounds” these words represent our young DJ & producer TIMIRASH. Born in Bacau he discovered his passion for electronic music in 2012. Later in 2015 he launched his first EP “Inceput” with Ensis Black label. He shared the desks with romanian dj’s like Gescu, Kozo, Alexandra, Sublee, Incolor, Melodie, Crihan, LIZZ, and others. * Interzis accesul persoanelor sub 18 ani. * Organizatorul isi rezerva dreptul de a-si selecta clientela. * Accesul persoanelor in locatie este strict interzis cu alcool din exterior sau alte substante interzise prin lege. Don’t drink and drive! – Te rugam lasa-ti masina acasa daca vei consuma alcool!